Coffee roasting specialist Andrew Willis has taken a roundabout route to launching his Sligo business. His journey has taken him from a Dublin upbringing via Europe, South America and Africa to finally settling on his grandparents’ farm. All his childhood holidays were spent with his mother’s family in Beltra. There he learned to love the countryside and farming and discovered the joys of surfing. However there was a big world to explore before the northwest would once again become the centre of Andrew’s world. He studied Biology at the University of Edinburgh and took his first real job in Wexford, working with the Slaney River Trust. This included talking to local groups and to journalists, which piqued Andrew’s interest and led to a significant career change. Fortune favours the brave and Andrew with the blithe confidence of youth and a reasonable command of Spanish, penned a letter to the editor of a Buenos Aires based newspaper. It landed him an internship and a totally new way of earning a living. He took to it like the proverbial duck to water, and a year later, Andrew the journalist had emerged. Buenos Aires has a strong Italian influence; outstanding coffee and ice cream but disappointing pizza. The coffee part stuck with him. His next job took him to Brussels working with the EU Observer. His arrival coincided with the Greek bailout saga which he covered for three years followed by a stint in The Congo. His final journalism job was in yet another hotspot – Colombia. This time he was with his Italian fiancée Paola in Bogotá, which fortuitously also has a strong coffee culture. Working for Bloomberg News, his mission was to cover commodities, mainly for the stock markets. He began to understand the coffee industry from the beginning of the chain, meeting farmers and seeing the entire process in operation. Andrew was hooked and began doing roasting and cupping (tasting) courses, including attaining the rigorous Q Grader certification. Keen to experience the practical side, he ordered a Huky coffee roaster online, in hope as much as expectation that it would make it all the way from Taiwan. Happily it arrived safely and he became a journalist by day and coffee roaster by night. The die was cast. Fittingly Paola is from Trieste, beloved of James Joyce and home of world famous Illy coffee, where the roasting aroma fills the air. Two years ago when they married, the wedding favours were tiny bags of single origin coffee. Andrew is passionate about allowing the unique characteristics of each coffee type to emerge. Instead of the familiar southern European dark roast, he takes a lighter approach and lets the flavours speak for themselves. You can taste the results at Strandhill Market, Beltra Country Market, Sweet Beat, Kate’s Kitchen and Shell’s Cafe. Thirteen years ago Andrew’s parents moved from Rathmines to his grandfather’s old house. 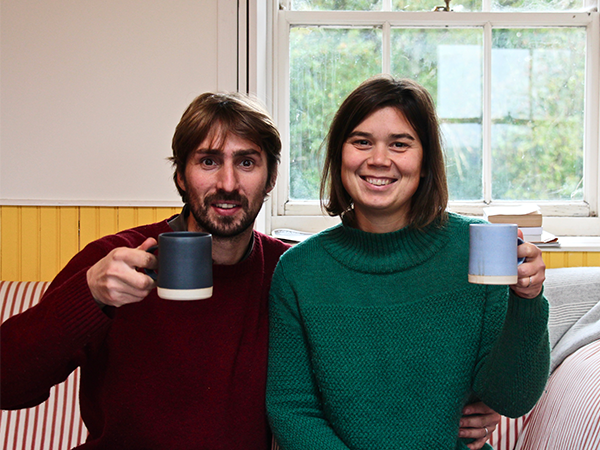 Last year Andrew and Paola joined them, setting up Carrow Coffee Roasters. Life is different, life is good – and when time allows Andrew is back to surfing.